Borsa Istanbul, majority-owned by the Turkish government, is the only exchange in Turkey, formed two years ago from the merger of the Istanbul Stock Exchange, the Istanbul Gold Exchange and the Turkish Derivatives Exchange. 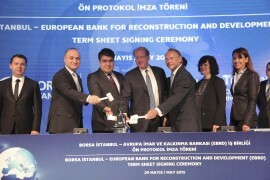 Representatives of the EBRD and the exchange met in Istanbul today to sign agreements that pave the way for a pre-IPO investment in the exchange. Expected to take place next year, the IPO is part of the Turkish government’s plan to reshape the country’s capital markets and create a financial hub for the region spanning Central Asia, south-eastern Europe and North Africa. The EBRD made a pre-IPO investment in the Moscow Exchange and invested in the Bucharest Stock Exchange. IT is also supporting SEE Link, an order-routing system established by the Bulgarian, FYR Macedonian and Zagreb stock exchanges and aimed at increasing liquidity and advancing standardisation among the connected bourses. Most recently in Turkey, the Bank has invested in YDA İnşaat’s first Turkish lira-denominated bond listed on Borsa Istanbul. It also works with the authorities on regulations and policies to further improve the functioning of capital markets. The EBRD started investing in Turkey in 2009, since which time it has invested more than €5 billion in the country through some 140 projects in infrastructure, energy, agribusiness, industry and finance. It has also helped raise more than €12 billion for these ventures from other sources of financing. The London Stock Exchange says that the launch of Turkish derivatives on its derivatives market represents part of the long-cherished goal of growing its derivatives business around the world. It also represents the exchange’s ‘open access’ policy. Electronic trading specialist Orc has launched a high speed connection to Borsa İstanbul. which brought all the Turkish capital markets exchanges under one roof in 2013. “Turkey is becoming an increasingly attractive market, with a steady rise in trading activity and demand from the region,” said Orc. Created in April 2013, Turkey’s new Borsa Istanbul exchange is at the heart of an ambitious project to turn Istanbul into a major global trading centre. With the country’s economy ascendant, Turkey has a lot to offer, according to Ali Çöplü, chief information officer of Borsa İstanbul. The London Stock Exchange is to begin trading Turkish futures and options, following a deal with Borsa Istanbul. The agreement will help to open up the Turkish market to more investors; it will also help to deepen the LSE’s derivatives market, which it has been trying to build up in recent years. Turkey’s newly-merged Borsa Istanbul has formed a deal with Nasdaq OMX, under which the new Turkish market will take up Nasdaq trading, clearing, market surveillance and risk technology. The European Bank for Reconstruction and Development and the Bucharest Stock Exchange are seeking to attract international investors to the Romanian stock market, following the launch of an ambitious government reform programme aimed at getting the country upgraded from frontier to emerging market status. Most people have no idea how good Turkish wine is, according to Martin Spurling, chief executive of HSBC Turkey. With over 1.5 million acres of land devoted to vines, it is a little-known fact that the Mediterranean country is the world’s fourth producer of grapes. The same can be said for Turkey’s ambitious plans to develop Istanbul as a major international financial centre.